Research suggests that personal and situational characteristics influence how and when residents provide guardianship over where they live (Reynald in J Res Crime Delinq 47(3): 358–390, 2010). However, there is limited empirical scholarship regarding what motivates residents to act as guardians and control crime in different contexts. 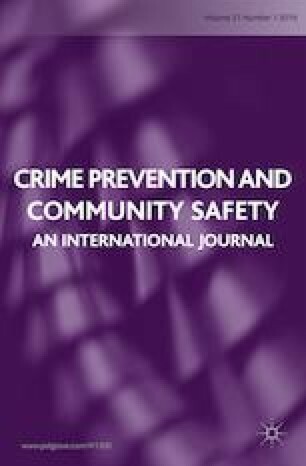 The current study explores the role motivation and opportunity play in facilitating monitoring and intervention among potential guardians against crime in suburban Australia. Twenty semi-structured interviews with Brisbane suburban residents were conducted and suggested the existence of four typologies of suburban guardians: active, opportunistic, responsive, and non-guardians. Factors crucial to facilitating monitoring include the physical design of houses, relationships with neighbours, prior victimisation, and daily routine activities. Direct intervention is supported by feelings of responsibility and capability. Other themes found to support guardianship decision-making were also identified, and results suggest that residents supervise and monitor their street regardless of current crime rates. Implications for theory and practice, and directions for future research, are discussed. Australian Bureau of Statistics. 2011. 2011 Census Community Profiles (website). Available online http://www.censusdata.abs.gov.au/census_services/getproduct/census/2011/communityprofile/3GBRI?opendocument&navpos=230. Accessed 3 May 2013.